My Dad in the middle, with his high-school buddy Geno on the left, and me on the right! My dad worked most of his life as a self-employed cabinetmaker. He was very reputable, and word spread for him only by way of word of mouth. My dad did many incredible projects, all out of our single car garage at my parents home in Northern Virginia, and my sister and I would help him out sometimes when he needed help. As I said, Dad was a reputable man, based on his upbringing, so he would only take 1/2 of the pay first in order to get the supplies he needed, and then take the rest of the money at delivery. He also had lower overhead then a lot of big cabinet firms did, so as a result he would charge less — less then he probably should have charged, because he did excellent work, and he didn’t charge enough for the pieces he created. I know that this will probably sound weird to my dad, because in all honesty, I had no great desire to follow in my Dad’s footsteps and become a cabinetmaker, but some of the best moments we had as father and son were in those times when I was helping him deliver and install the cabinets and other works that his clients asked of him. I’ll never forget the many times that we rode out to Mr. & Mrs. Boyd’s house near Georgetown. Mr. Boyd had worked for the DC Police Department before retirement, and he and his wife had a very eclectic house, that was high up on a vista, and had a backyard that sloped pretty steeply right down to the water of the Potomac River. I loved visiting their house with Dad, and helping him out, because inevitably Dad would let me take a break and walk around outside for a few minutes, examining all of the incredible nooks and crannies of the Boyd homestead. My Dad did a lot of work that he took pride in, some of it big, and some of it small, and some of it, even that ended up being used around the country and even ended up being featured in publications! My dad was commissioned once to make a gavel for a lawyer publication, if memory serves me correctly, and the gavel he mad was used on the cover photo of the magazine. Dad also did some work for United Airlines, who my Grandpa worked for before he retired from the company. Dad created some special kiosk type cabinets that we transported to the Newark Airport in Newark, NJ, and were used in the main terminal for many years of reliable operation. 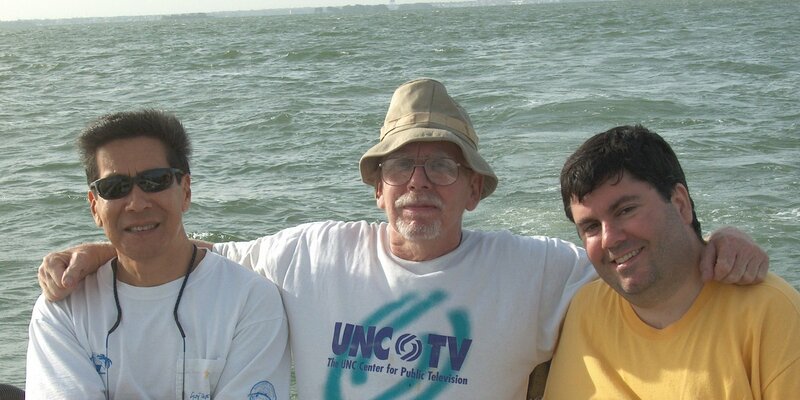 After I moved to North Carolina, my dad and I did a few trips together while I was in my single days. One trip we took to visit my Aunt Ginny in Missouri, stopping along the way and visiting with my Great Aunt in Dayton, Ohio, and having lunch with one of my Dad’s cousins (I know, my cousin too) in Illinois before reaching the St. Louis area. That was a memorable trip, and one that I haven’t forgotten, all these many years later. However, when we got there, we took our gear out of the car and started hiking along the trail to find a spot to camp, and not paying attention, we probably hiked a mile downhill until we stopped to setup camp. Of course, the next day, we had to hike a mile uphill with all of our gear! That was not so much fun for us! On the third night, I think we were both getting sick of camping, so we found a spot that had campsites right next to where you park your car! That worked for me, so that’s what we did! Do you spot a trend here? During our travels, though, we experienced some incredible moments — such as the time we had to stop right in the middle of the road because there were literally dozens of wild turkeys just standing in the middle of the road. I would guess that there were easily 30 or 40 turkeys! We also ate a great meal in Linville Falls, NC, at a local restaurant there that had the distinction of having signs up in the restaurant telling you when you were entering a different county, because 3 counties intersect in Linville Falls! Now that I’m married, my travels with my dad are fewer and more spaced out, but we are still able to enjoy some time together. One time when my parents came down, Dad and I spent some time and went on a photo shoot together. Dad has recaptured his love of photography, and takes some wonderful photos that have even been awarded ribbons at contests before! I have an affinity for trains, so I’ll close with this picture Dad took of this wonderful train. Enjoy! Thank you all for reading my long post — I’m sorry that it was so long, but I’ve only got one Dad, and I wanted him to know how much wisdom he has imparted on me over the years. It’s not always easy to write about your loved ones, but Dad, I love you, and I hope you enjoyed your post — and your photo in the post as well! Happy Birthday Dad! Welcome to the first stop aboard Magical Blogorail Green. 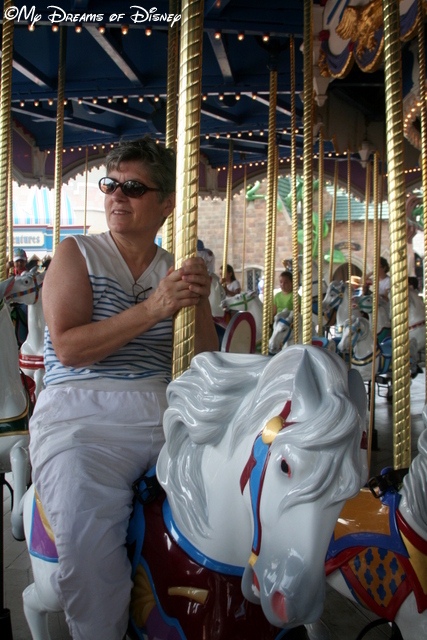 Enjoy our therapeutic ride as we share ways that Disney has helped us through times of grief and sorrow. Over the past year, a lot of my friends have had loved ones pass away — and in way too many cases, it was young children that were called home. In this week’s Magical Blogorail post, we are talking about ways that Walt Disney World (or the other Disney parks) have played a role in helping us deal with our grief and sorrow. 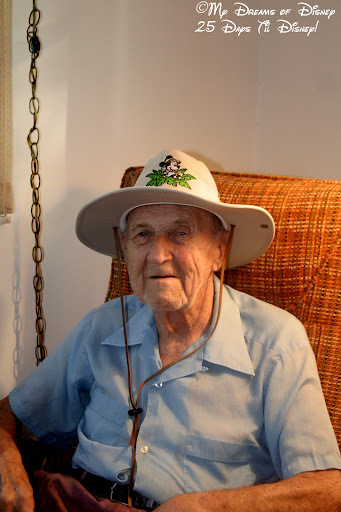 My Grandpa died just over three years ago at the young age of 98. While my Grandpa wasn’t as big a Disney fanatic as I am, my Grandma and Grandpa were the ones that first took me (and my sister and Mom) to the Magic Kingdom, way back in 1979. When I was in my pre-teen and teenage years, my summers were spent visiting Grandma and Grandpa (primarily Grandpa) during the summer vacation, and he and I spent many a day having fun and doing cool things together. It may be hard to imagine, but as you can see by this picture, my Grandpa was cool. My Grandpa sporting my Safari Mickey hat! Now that I am a dad and husband, I have played a similar role to the role that my Grandpa played — I introduced Walt Disney World to my wife Cindy in 2000, and together we introduced our daughter Sophie to Walt Disney World in 2005. 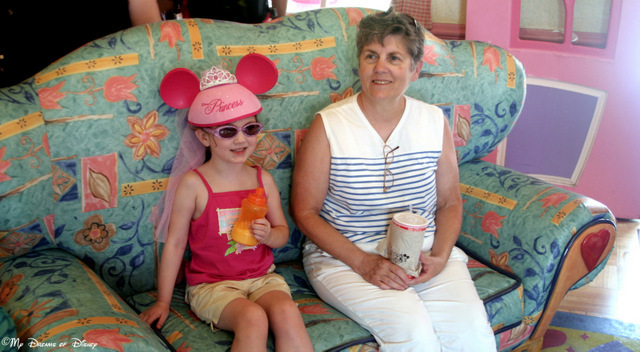 One day in the future, I can’t wait until the day when Cindy and I introduce our grandchild to Walt Disney World. Only God knows when that will be, but if He is willing, it will happen. In some ways, I always thought that my Grandpa and Walt Disney had a lot in common, and now in my family, I am doing some of the same things that those two great men have done. My daughter Sophie and I are training for our first 5K together — the Princess 5K to be held February 19-22 of next year. While we aren’t running for any specific person or for any cause or in honor of a loved one that passed away, we are forming a stronger bond because this is something that only we are doing. My wife Cindy is involved, but she’s choosing to cheer us on at the finish. She knows that the days are coming when Sophie will not want to spend much time with us, and she is giving Sophie and I this event, the 5K, as a way for us to continue our Daddy/Daughter relationship for a bit longer. In my minds eye, I picture it as similar to what Walt did by taking his girls to Griffith Park to ride the carousel. Of course, there are other 5K events — you don’t need to travel to Walt Disney World just to run in a 5K. In fact, we are going to be doing the Walk for Hope in Raleigh on October 12th — and that’s a 10K walk (we’ll run some too). That event benefits mental illness research and treatment, so if you would like to donate to it, you can do so by clicking on this donate link. But the point I’m making is that we’re continuing our bonding by participating in an event at Walt Disney World — and in my opinion, Disney is the mechanism for us to keep our relationship close, even though she is a teenager. While I haven’t relied on Disney as a truly therapeutic way to deal with the loss of a loved one in a physical sense, like my friend Beth did when she lost her nephew, or my dear friend Dawn did when she lost her father, or my friend Kuleen did when her friends lost their child, I have used my connection and love for Walt Disney World — and my daughter’s love for Disney, too — as a way to keep us close when so many families see their daughter or son drift apart from them. Regardless of the setting, whether it is Disney or the beach or the mountains or whatever, use those memories and experiences as the means to keep your loved ones close, or to remember their memory if they have passed on. Thank you for joining me today. Your next stop on the Magical Blogorail Loop is In the Mouse House. 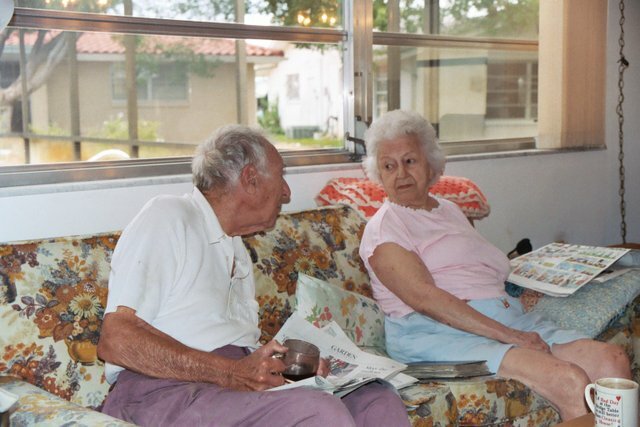 My Mom and her Dad, my Grandpa, in 2007. Today, my friends, is my Grandpa’s birthday! He would be 101 years old today! It’s hard for me to imagine that this time three years ago, he had just passed away in his sleep. My Grandpa was 98 when he was called Home, and he is probably the only person I will ever meet in this life that was called home on the same day that he was born. I consider myself a very blessed man to have been able to have my Grandpa (and my Grandma, too, for that matter) in my life for as long as I did. It’s not every person that can say that they had their Grandpa with them until they were 43 years old. Sophie was 10 years old — she had her Poppy (that’s what she called her Great Grandpa) for 10 years of her life. Grandpa surrounded by his three children, their spouses, and one of his granddaughters! 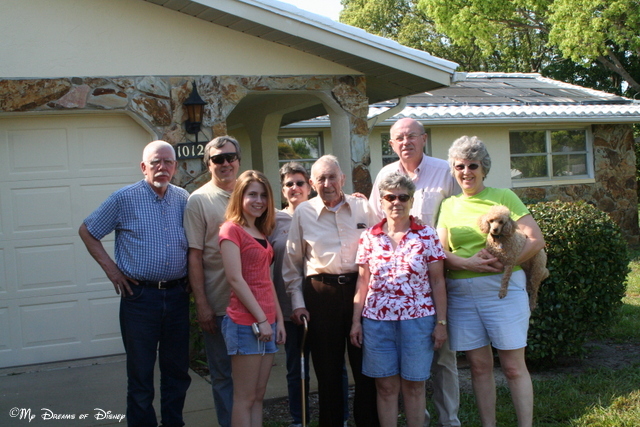 This was a bittersweet day for us — this was the day that we moved Grandpa out of the house that he and Grandma had bought in Florida, and moved him north to live with my Mom and Dad. It was bittersweet because we had so many great memories from those visits, but we knew that Grandpa couldn’t live there anymore on his own. This was not long after Grandma had passed away. 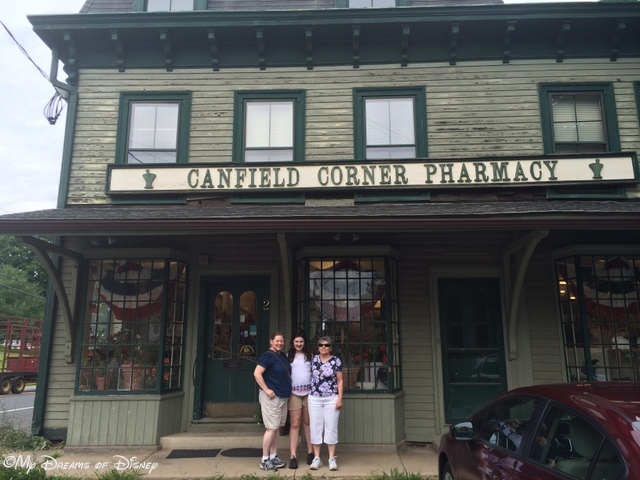 This past July we took my Mom to the pharmacy that my Grandpa’s Dad ran! Part of remembering Grandpa was in taking a family trip to visit where he grew up as a boy in Connecticut. My Great Grandfather was the pharmacist that owned this pharmacy, and my Grandpa in his youth was a Soda Jerk! They had their house just a short walk up the street. It was a lot of fun visiting that area and meeting the current pharmacist and just visiting areas that I had never been to before! This is the Memorial Gardens where Grandma and Grandpa’s ashes are buried. This is at their church in Florida. Grandpa was buried in the same Memorial Garden that my Grandma was five years earlier. 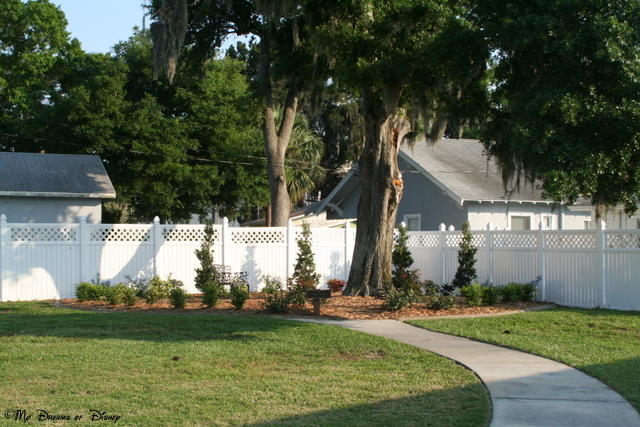 They both opted for cremation, and this Memorial Garden was established by their church in New Port Richey, Florida. It is a fitting tribute to the church that despite the fact that Grandpa hadn’t been to that church in five years, there were still members of the congregation that remembered him and my Grandma, and made it a point to come to his service. 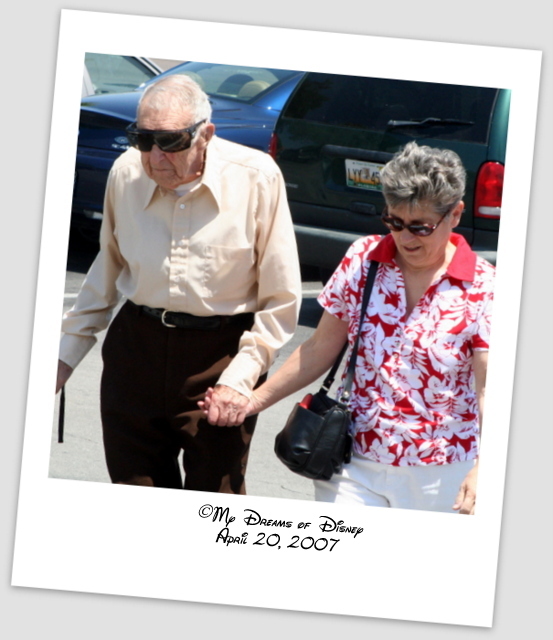 My Grandpa was a man of firsts — the first person (along with my Grandma, of course) to take me to Walt Disney World. The first person to teach me to swim — we actually taught each other! The first person to teach me all of the different airplanes that he knew from his days working for United Airlines. Lastly, my Grandpa showed me, through his love for my Grandma, the perfect way to treat your wife, and that is something that I will never, ever forget. Today we are taking the lead from my friend Heidi over at Heidi’s Head, and we are sharing a new post called Three Things Thursday! This post is just a little whimsical one that will give you a glimpse into who I am. I hope that you will like it, and perhaps learn a little bit from me that will help explain why I am the way I am. 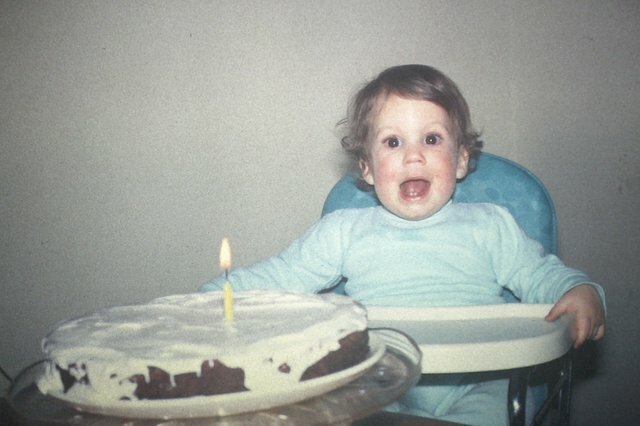 Even as a one year old, I have always been excitable…I remember the time my Grandma got me a hot dog and told me to hold on tight to the hot dog so I wouldn’t drop it — well, the story goes that I held on so tight that the hot dog shot out of the bun and landed on the floor! My Grandma and Grandpa were the ones that took me, my Mom, and my sister to Walt Disney World for the first time, in 1979. Additionally, I would spend the summers visiting them as a kid, and my Grandpa and I learned how to swim together in the neighbor’s pool by checking out library books on a particular swimming stroke we wanted to learn, and then reading a chapter and practicing at the pool. My Grandma was 93 when she passed away, and my Grandpa passed away on his birthday at the young age of 98. Cindy and I have been married for thirteen years now and counting, and we were blessed with our little angel Sophie in June. 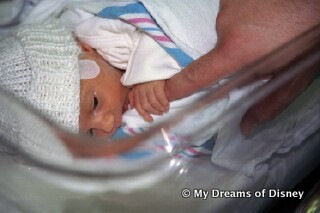 When Sophie was born, she was only 4 pounds, 2 ounces, and was only 17 1/2″ long. Her whole hand, as you can see, could grip one small section of my index finger. Cindy and Sophie are the light of my life outside of God. Thank you for stopping by today! Please head on over to Heidi’s Head to see what other entries she has for you, and thanks!